Sherwood Bedding has secured the license to manufacture and sell latex mattresses in North America under the internationally renowned British brand Dunlopillo, and the Colorado Mattress Company couldn’t be more excited. 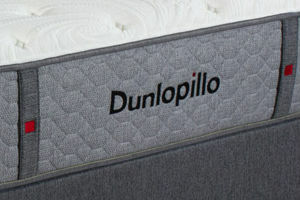 Dunlopillo mattresses allow for maximum breathability, guaranteeing a perfect night’s sleep. Dunlopillo latex provides a yielding, giving and conforming quality, so is a perfect choice for people looking for unparalleled comfort and support. And, if you or your partner struggle with allergies, natural Dunlopillo latex provides a safe option as it is naturally hypoallergenic and anti-microbial. Made using a specially selected 7-Zone 100% natural latex product, Dunlopillo beds provide pressure relief by molding to your body and supporting your ideal sleeping position. All Dunlopillo products have Climazone treated fabric that regulates your body temperature during the night to provide you with a truly spectacular sleeping experience.